Growing up in a Chinese household, roasted meats regularly made it onto our dinner table each week. However, given the fact that both my mother and father worked full-time jobs, in addition to raising three crazy misbehaved children, these meats were never prepared at home (despite my mother being an amazing cook). It would just take too dang long. Instead, each week my parents would drive to China town and pick up their groceries, including BBQ pork, roasted duck, and my all-time favorite, roasted pork belly (Siu Yuk in Cantonese). The juicy meat, coupled with the delicious layer of belly fat and impossibly crispy skin was to die for! While there are countless recipes on how to make roasted pork belly purely with an oven, I’ve never tried my hand at making it myself. A few weeks ago, I got the crazy idea that my first attempt at this would be with sous vide. I figured that if I couldn’t get the impossibly crispy skin, I would have the juiciest meat possible. 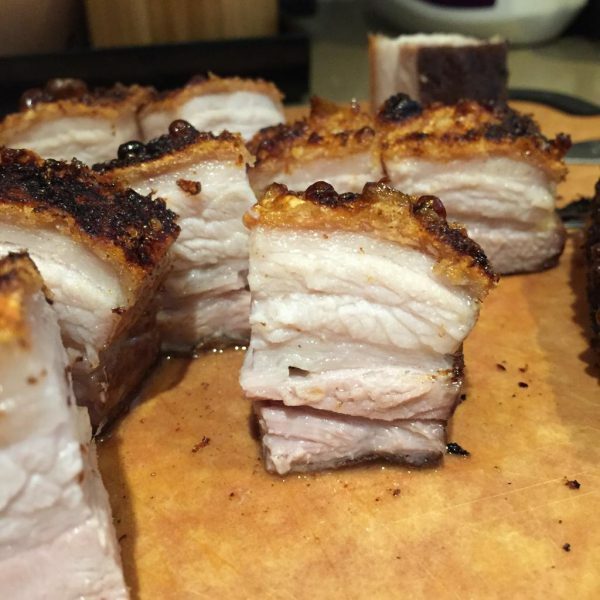 You’ll find countless sous vide pork belly recipes online that advocate for a longer cook time (24-72 hours), but to replicate true Chinese crispy roasted pork belly, all you need is 6-8 hours to achieve the perfect texture. First, you need to ensure it is as flat as possible when you’re cooking it in your water bath. 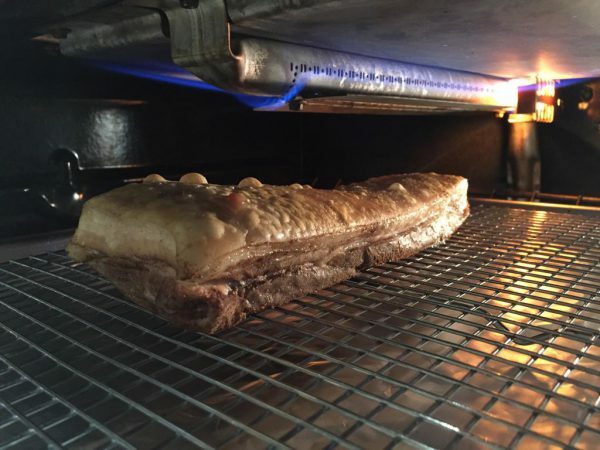 Without some structural support during the sous vide process, the pork belly will naturally fold up, making it harder to crisp up in the oven in the final step. Second, a light brushing of white vinegar before you broil it will ensure a nice even, and faster, browning. While I did it at 72.5C, future attempts will have me experimenting with lower temperatures such as 62.5C. 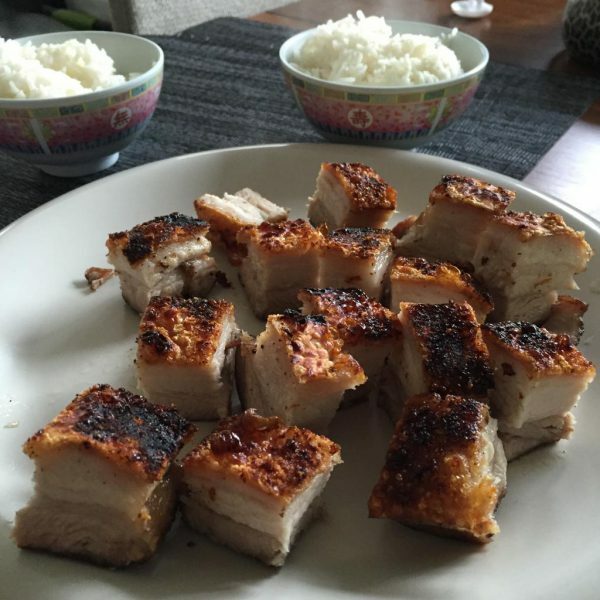 Now go enjoy a piece of my childhood and make some delicious roasted pork belly! Heat your sous vide bath to 74C / 165F. Using a sharp pairing knife, slide horizontal cuts through the skin about 1-inch apart. Be careful to only cut through the skin and not too deep into the underlying fatty layer. Criss-crossed two skewers (I used metal ones) from corner to corner. This will keep the pork belly flat as it is being cooked sous vide. This will help make it easier to crisp the skin later under the broiler. In a small bowl, combine the salt, white pepper and Chinese five spice power. Sprinkle halfof the mixture generously to cover the underside of the pork belly (opposite side of the skin). 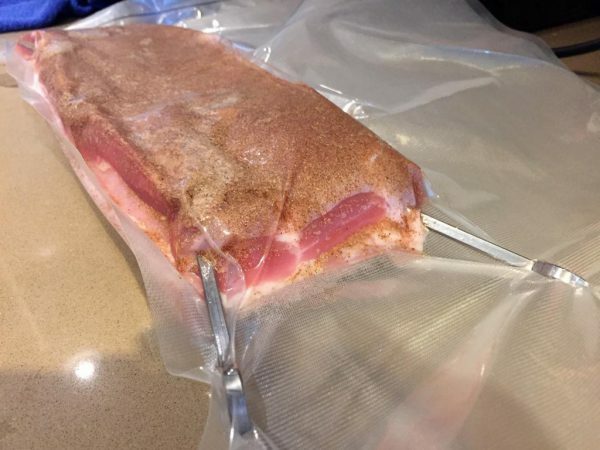 Vacuum seal your pork belly. 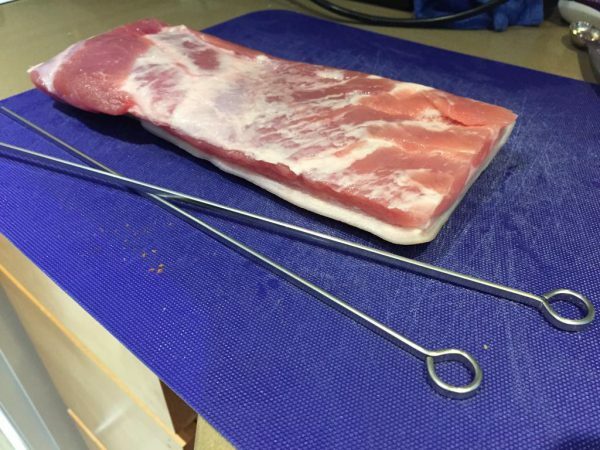 If the tips of your skewers are exposed on one side of the pork belly, make sure you don't puncture the bag as you vacuum seal or handle it. Cook the pork belly for 6-8 hours. Any longer than this will significantly change the texture. At the end of the sous vide bath, cut open the bag, pour away the accumulated liquid and remove the skewers. Using paper towels, pat the entire belly completely dry, with extra focus on the skin. Make several passes to make sure it's completely dry. Take the remainder of the salt, white pepper and Chinese five spice powder and sprinkle on the underside of the belly (opposite side of the skin). Flip over the belly, and brush it with a very thin layer of white vinegar. This will help it crisp more quickly and evenly in the oven. 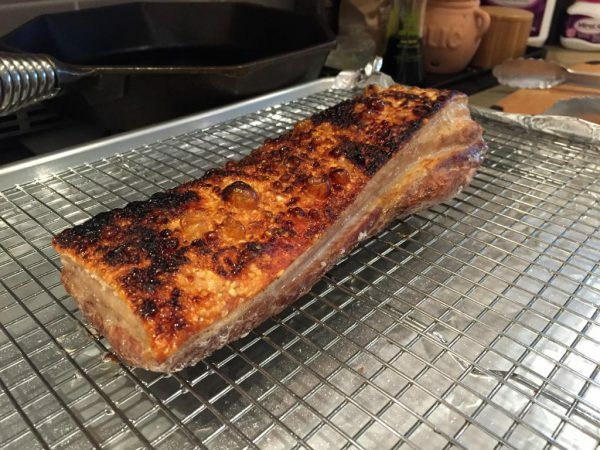 Lay the pork belly on a baking sheet with a rack, so it is elevated off the tray. Put it under a broiler set to high and cook it to crisp the skin. As it's cooking, you will need to move the tray around to avoid hot spots burning too much of the skin. After about 10-15 mins, the skin will be a nice dark brown and you can remove it from the oven. 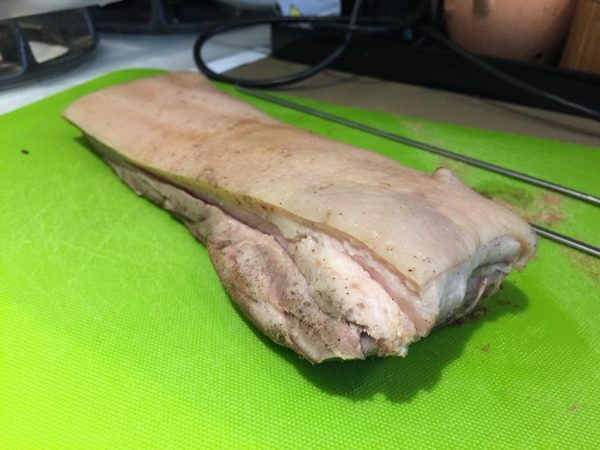 Laying the pork belly on a cutting board, use a large Chef's knife or meat cleaver, cut into bite sized pieces. While I left the skin intact, you can optionally scrape off any of the skin that's too blackened to improve the presentation. Serve with white rice and Chinese chili sauce. OMG! Looks so damn delicious!